The FSU Annual Meeting will be this Wednesday, May 2nd at noon in Wheatley, 2nd floor, Classroom 0198. We will serve you pizza! This is an opportunity to update you on what is going on, receive your feedback, and talk about your areas of concern and what the FSU should be working on. 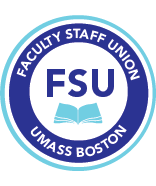 The items to be considered include the FSU budget, bargaining, and the Mount Ida acquisition. Please attend and give us your thoughts. Contact the FSU to see the agenda and the proposed budget. See you soon! Marlene Kim, Economics Professor and President of the Faculty Staff Union. Remarks at the UMB Community forum, April 18, 2018. We are here today to say that UMass Boston will not be treated as a second class citizen. The UMass System, the Board of Trustees, and Board of Higher Education needs to provide educational opportunities to all its citizens, including the underserved. The Massachusetts legislature needs to provide funding and oversight that’s needed to ensure this. ► UMB Community Meeting: Tomorrow, Wednesday, April 18, at 12 noon in Campus Center Ballroom A, we will be discussing the UMass Mt. Ida Acquisition, parking fee increases, budget cuts to Centers and Institutes, providing debt relief to UMB, how we can Stand up for UMass Boston at this key juncture. See the FSU Facebook Event Page here. Please attend!